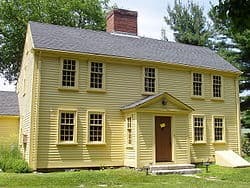 The Jason Russell House is a historic house in Arlington, Massachusetts, the site of the bloodiest fighting on the first day of the Revolutionary War, April 19, 1775 (the Battle of Lexington and Concord). The house was purchased in 1923 by the Arlington Historical Society which restored it in 1926, and now operates it as a museum from mid-April through the end of September, together with the adjoining Smith Museum, built in 1981 to house changing exhibitions of life in Arlington. About 1740, Jason Russell (1716–1775), a relatively prosperous farmer, constructed the core of the house on pasture land he inherited in 1738. The house he built had two rooms, one over the other, with the chimney and stairs on the north end. In order to have the front facing south, in the New England tradition, he placed the north side angled toward the Concord Road (now Massachusetts Avenue). Perhaps five or ten years later, he added two more rooms to form a typical New England farmhouse with five windows across the front, a door in the center and a large chimney in the middle of a pitched roof. There is some evidence that the hall (or kitchen) and its chamber above, as well as the garret, were original to Grandfather Jason’s original structure of 1680. The hall and parlor of the house, with their chambers and the garret, are essentially unchanged today, although in 1814 a porch (or vestibule) was added to the front door, and further extensions were subsequently added to the sides around 1863. Inside the central part are four rooms: to the left of the entry are the kitchen and children’s chamber (above), and to the right, the parlor and parlor chamber. The kitchen ceiling retains its original whitewash and sponge painting decorative surface treatment. The outside walls may have been plastered originally, but in 1924, when the house was restored, wood sheathing was installed. These skirmishes erupted into a full fledged battle at the Jason Russell House. 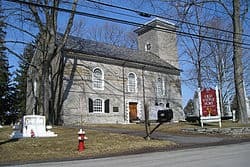 A company of minute-men under the command of Gen. Gideon Foster, along with several other companies of minute-men and militia, had left Danvers earlier. All reached Menotomy before the British. Many of them went into a walled enclosure near the Jason Russell House where they planned to intercept the retreating soldiers. Despite being warned to watch for a flank-guard, by Israel Hutchinson, one of their company captains, they focused on the main body of British as it passed. When the party flanking the Concord Road to the south surprised them, the Americans fled to the Jason Russell House. Jason Russell was 59 and lame. At noon, he had started with his wife and children to seek safety at the George Prentiss house higher up on the hill, but after proceeding part way he sent them on alone and returned to his house. 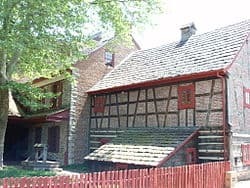 A nearby neighbor, Ammi Cutter advised him to seek safety, but Russell refused, reportedly saying “An Englishman’s house is his castle.” Cutter himself was nearly killed by fire from an advance flanking party. Stumbling and falling between mill logs as bullets hit their bark around him, he was thought dead and the British passed him by. Russell was outside his house and joined the minute-men as they fled toward it. Being old and slow, he was in the rear and was shot twice as he reached his own doorway and then stabbed eleven times with bayonets. The British rushed into the house, killing everyone they could see. Eight minute-men made it to the basement and survived by pointing their guns up the stairs. When Jason’s wife returned, she found her husband and all of the dead laid side by side in the kitchen. She is reported to have said the blood in that room was almost ankle deep. The house itself was riddled with bullet holes, many of them still visible. The blood stains on the floor were still visible when it was replaced in 1863. 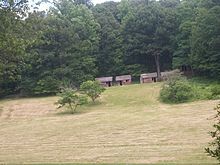 Jason Russell’s estate was settled in 1776. His house and 117 acres of land were divided between Noah, his only son left at home, and his widow, Elizabeth. She received the 17 acres the house was standing on together with half the house, “Libberty to ues the oven when wanted” and additional privileges of use, including space in the barn. Noah received the other half of the house, half the barn and some lands. Other children got other parts of the estate. Elizabeth Russell lived in her northerly rooms until the eleventh of August 1786 when she died aged 65.